Our new Finny visors are designed after our best catches in the Finny Wireman Series. 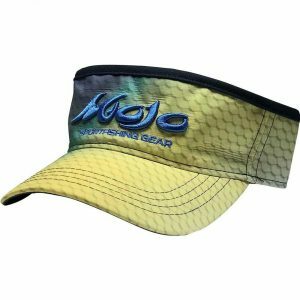 Custom-made with raised stitching on the logo, a water-resistant fabric, and the traditional visor look to keep you cool during those hot summer days on the water. The visors have a velcro closure for an easy wear throughout your day. Make our Finny line your new go-to good luck charm, pick your fish, get on the water and reel em’ in! At Salty Hook, we want you to be completely satisfied with your order. If you are unhappy for any reason, returns can be made by shipping your item(s) back to Salty Hook. We will exchange or give you credit for any item that is in like-new condition and unworn. We do not take responsibility for any product being lost or stolen or damaged once it has left our premises. Welcome to Salty Hook Online Fishing Store. We’re glad you found us! Please have a look around for all your online fishing store requirements. We stock just about everything but if there is something you can’t find on this online fishing store then please let us know as we may be able to source it for you!